Compression Coupling: Used to join lengths of steel EMT conduit. 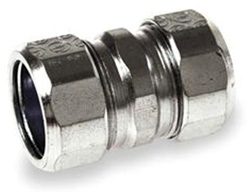 *Compression Coupling: Used to join lengths of steel EMT conduit. Braided Flexible Metal Conduit System is widely used to counter mechanical stress and is highly flexible, and it is resistant against tensile stresses and transverse pressure. Braided flexible conduit also offers excellent protection against hot metal particles, and immunity from electromagnetic interference. Braided flexible steel conduits are most suitable for use in Hazardous Locations, industrial environments and high temperatures wiring applications. Most suitable for Connecting flexible conduit to electric box or enclosure. 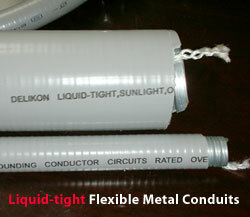 LT liquidtight Connectors offer excellent pull-off characteristics.